Safari Rangers are a leading overland, fly-in and fly-drive safari tour operator to South Africa's popular Kruger National Park, offering complete safari tours, which have proven over the years, to exceed visitors expectations, for going on safari in South Africa. Out of all the national parks in South Africa, the Kruger National Park should be your first choice as a destination for your South African safari. There is no question of this. It's one of those destinations that has to be experienced, as it offers the very best wildlife viewing and once visited, will never ever be forgotten. The Kruger National Park is one of the largest game sanctuaries in Africa and is still very much considered to be one of the world's foremost wildlife reserves. It is immense, over 2,000 000-hectares and naturally, has a tremendous botanic diversity. This great park, more than any other national park in Africa epitomises the mystery and magic of living in the bush for a few days. It's big, bold, beautiful and full of amazing animals. 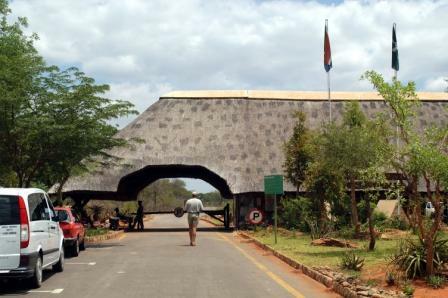 Kruger Park is home to approximately 145 mammal species including the famous collection of animals known as the Big Five - Lion, Leopard, Elephant, Rhino and Buffalo. Summer season (September - March) is the season during which all the animals flourish because of the summer rains - it's the time of plenty. As a result of the rains the park is transformed into a green paradise. It's the time to enjoy beautiful trees and flowers. Hundreds of Impala lambs are born; staple diet of all the predators. During the summer season you must be prepared for day temperatures of 27°C with max temperatures reaching 40°C. The temperatures at night fall to around 20°C with occasional thunderstorms. Winter season (April - August) is the dry season. Because it virtually doesn't rain in winter, the park is transformed into a brown and almost barren landscape. The animals concentrate at the perennial waterhole's and rivers. The grass is low, the bushes and trees have lost their leaves. As a result one can have an unobstructed view through the bush making the game viewing much easier. During the winter season you must be prepared for temperatures dropping to 7°C at night with the odd night at zero°C. Average temperatures during the day, reach a very comfortable 20°C. 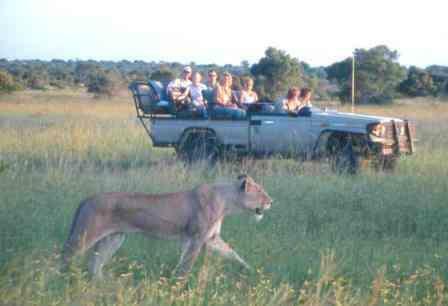 We know you will enjoy some of the best wildlife viewing available in the Kruger Park, no matter what time of the year. Every person on one of our safari tours of Kruger Park will view large accumulations of wildlife in their natural environment - Elephant, Buffalo, Zebra, Giraffe, Wildebeest, Impala, Kudu and Waterbuck; just to name a few common species. With all our Kruger Park safaris we guarantee you will stay in the world-famous Kruger National Park and not in a reserve next to Kruger Park; falling within the latest new term 'Greater Kruger National Park'. Our itineraries are very detailed providing you with a very real idea of what can or does actually occur on each of our Kruger Park tours. We suggest you bring light neutral colour clothing on safari - no white clothes. The night game drive can be chilly even in the summer months so we recommend you bring a light warm jacket. We also recommend you bring insect repellent, sun block, sun glasses, a hat or cap, walking shoes, torch/flashlight, 7x50 binoculars, camera and spare memory cards. There will be a power supply available to re-charge camera batteries etc.